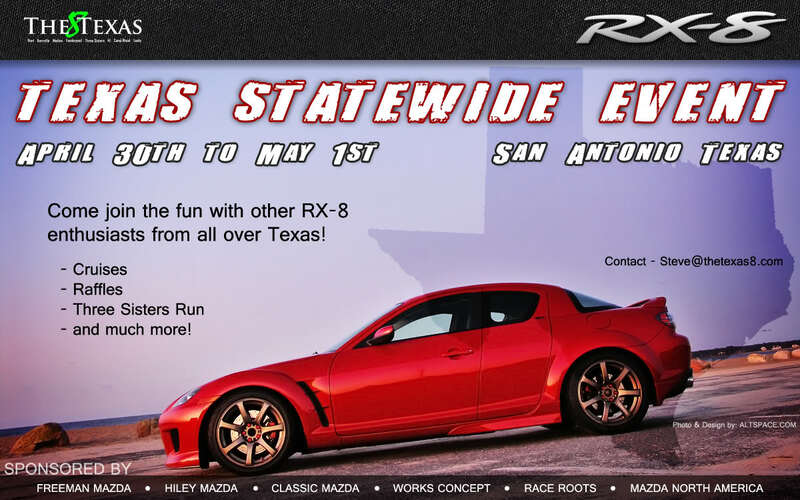 This years event will be taking place in San Antonio with us making the "Three Sisters run" on Saturday. The event will include a group dinner on Friday night, making the Three Sisters run on Saturday and then another dinner Saturday night along with raffling off prizes and then say good-bye's and check out Sunday. Phone: 210-249-4800 <-----Call this number to reserve your room! I currently have 10 rooms blocked off, if we need more then we can get them. We are getting a special rate of $49.99 a night (we are staying two nights) and that is either a 2 queen or a 1 king bedroom, so if you get a few people in a room you can stay for the trip at $50 or less. Hotel stay includes a FREE deluxe hot breakfast, free wireless high-speed internet, 24hr fitness center, pool & hot tub, free 24hr coffee, tea and juice! When you call in to reserve a room all you need to do to get the rate is tell them that you are with the "Texas RX8 car club" and they will then put you in with our group rate. -MVP Motorsports - May be bringing a project car if done in time. 17. Quicksilver34, Raymondville, Needs room? 18. 05rx8mazda, Austin, Need room? 32 cars in all so far! Last edited by seatownracer; 04-14-2010 at 07:25 AM. Creto was the designer of the T-shirts as well as finding us a sweet company that allowed us to set up our own shop which means none of us have to manage any of the money! If you have any questions or comments please feel free to post them. Last edited by Riley Craven; 03-20-2010 at 08:53 PM. Woot!!! First Post in here!! I am ready! third...lol how come im not on the list of people attending?? Because you need to post up on this thread that you are coming, after that I will add you. So TheJew89 want to share a room? Last edited by Myardor; 02-04-2010 at 09:59 PM. So who else planning on coming to the event!? I know there are more of you out there! I'm coming. Will book room, next monday. The transmission set me back, but I'll be there. Houston! where are you guys at!? We have people coming from Oklahoma yet no interest from the 8's in Houston? Seriously where are the austin and houston peeps at?! I like to come, just depends on what training we have coming up for my unit. If all goes well will be traveling from Fort Bliss. I'll keep you all posted. Quick Reply: 2010 - The Texas 8 event "Official Thread"